We took a little bit of time off from our giveaways over the holiday season, but we are back in the new year with a great new giveaway from Milwaukee Tool. Up for grabs this month is the Milwaukee 2603-22 high performance M18 Fuel brushless cordless Drill/Driver, a tool that features some of the latest in cordless tool technology. If you are looking for a powerhouse in a drill, this is it. The Milwaukee 2603-22 ½-inch Drill features Powerstate Brushless Motor technology that delivers up to 725 in lbs of torque. The Redlithium Battery system gives the tool longer battery performance and battery life because of an electronics system that communicates with the tool and charger using the Redlink Plus Intelligence system. You can take a look at my review of the similar Milwaukee 2604-22 Hammer Drill to see that these features enabled the tool to drill over 100 1-inch holes into Douglas Fir with an average time of 4-second per hole on a single battery charge. Visit Milwaukee Tool to learn more about the M18 Fuel line. 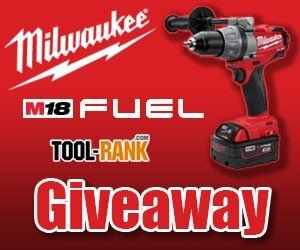 The giveaway is for the Milwaukee 2603-22 Drill/Driver Kit which includes 2 batteries, a dual-voltage charger, and a carrying case.